Old spacesailors tell the tale of Jotunn Skølldir, who was banished from his homeworld and carved a path of destruction through the galaxy. Worlds that fell victim to his rage were swallowed by lava or entombed in ice, leaving none alive. Supposed to wield both fists of undying flame and the cold of an eternal winter, Jotunn Skølldir truly is one of the last remain legends of the galaxy. Those who have witnessed the destruction left behind by him are never the same. 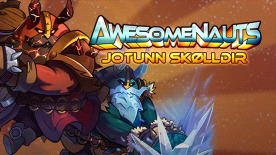 This DLC contains a custom skin for Skølldir in Awesomenauts. The skin-design and sound effects vary depending on whether the player is currently playing for the Red or the Blue team, with Jotunn Skølldir assuming his fire-form in the Red team, and an ice-form in the Blue team. The Jotunn Skølldir skin does NOT have a unique voice over. Jotunn Skølldir was designed by community member CrimsonYeti for the Design-a-skin competition and was chosen by the community as one the runner-ups to Grim Genji from more than 250 submissions!